If you think your cat has a loud purr, meet Merlin, the new record-holder as the cat with the loudest purr in the world. At 67.8 decibels, he even out-purred Smokey, the previous record-holder, who registered a mere 67.68 decibels on the Guinness Book of World Records' adjudicator's scale. For comparison's sake, most cats purr at about 25 decibels. Merlin and Smokey both live in the UK. So think about living with a cat whose purr is nearly as loud as a dishwasher or shower. When Merlin's really happy, he can drown out a conversation and make the television hard to hear. Tracy Westwood and her daughter Alice adopted Merlin from a rescue when he was a kitten. Thirteen years later, he's still going strong, especially in the purr department. “Occasionally when he’s really loud I have to repeat myself," Westwood told Guinness writer Kevin Lynch. "When you’re watching films you have to turn the telly up or put him out of the room, if he’s eating he’ll purr loudly. I can hear him when I’m drying my hair. If the telephone rings I do get people asking me ’what’s that noise in the background?’ I tell them it’s the cat but I don’t know if they believe me." 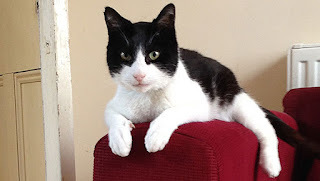 Merlin was recently crowned King of Purrs on a British TV show and received a certificate from Guinness. But the best prize was a dish of his favorite food.. tuna.